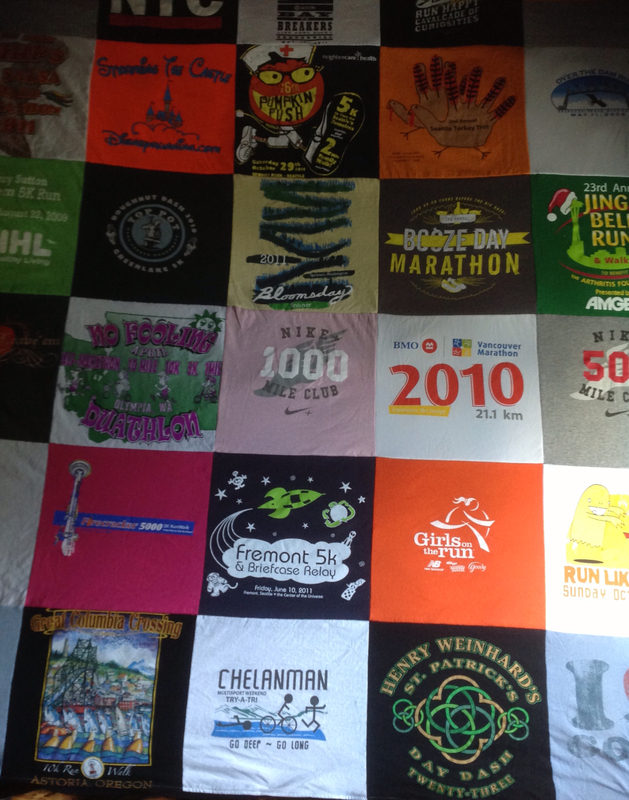 Like a lot of runners, I have accumulated a lot of race shirts over the years. Some are very special, like my NYC Marathon shirt, my Goofy Challenge shirts, and even some of my Rock 'n' Roll Half Marathon shirts. But others... well... they were too dear to me to throw away, but too numerous (or, in some cases, colorful...) to wear. So I would periodically clear out my "running stuff" drawer and retire a bunch of shirts to the basement. I'm crafty, so I always had this idea that I would make a t-shirt quilt. You know, just cut 12.5x12.5" squares out of each of the shirts, sew them together, and then quilt them. Nothing fancy, just a nice big throw. But like many of my other would-be craft projects, real life got in the way. I even sent so far as to cut squares out of a handful of shirts... but did nothing more than that. Then a couple of months ago Groupon offered a "$130 donation to Project Repat" for $65. In exchange for the $65, Project Repat would make a 5" x 6" (essentially exactly the size of a queen-sized mattress with no overlap) quilt if I sent them at 30 shirts. Perfect!!! Somehow, even digging out the piles of old shirts -- and deciding which ones to "sacrifice" to the quilt -- took a long time. 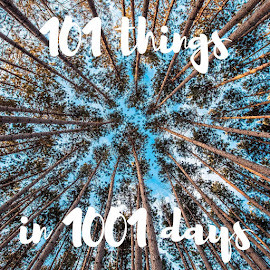 But a few weeks ago I sat down on a rainy afternoon and sifted through the boxes. I'm ashamed to say it was VERY EASY to come up with 30 shirts. Even the act of going through the boxes -- looking at all of the shirts, remembering all of the races -- was great. I also took the opportunity to GET RID of a bunch of shirts -- duplicate, mostly, when Wil and I both ran -- and made up a big box of shirts for Goodwill. So satisfying!!! I went to the website, picked out my backing fleece (black, of course, though navy is also available), and got out my scissors. I cut the fronts off the backs (to lighten the weight of the package -- though I could have sent them all of the shirts), packed them up, and then waited. I could have paid extra to have the shirts arranged in a particular order or pattern, but the designers at Project Repat will use their best judgement in laying things out. After all, these shirts were just sitting in boxes in the basement; so anything would be better! A few days later I received a note saying that they had received my shirts, and that if I had any questions I could call them. 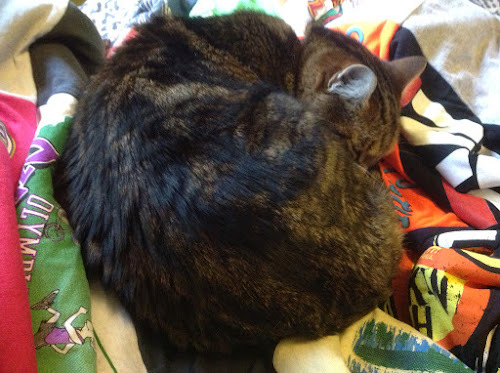 And then, a couple of weeks after that, I received a note saying my blanket had been shipped. I wasn't in any sort of hurry (BASEMENT! ), but was surprised at how quickly they completed the process. so big I couldn't get all of it in the frame! Wow!!! It's so great!!! Now, is it the finest example of the quiltmaker's art? No. It's just 30 t-shirts trimmed square, sewn together, and then backed with fleece. It's not actually quilted, per se -- the top and bottom layers are only joined at the outer edges. But the weight of the shirts and the clinginess of the fleece make them feel as if they are joined. The corners of the top are well matched, the stitching is even, and the way they laid out the colors is really pleasant. I am absolutely thrilled by my new blanket. Wil -- who I think may have been a bit dubious at the idea of this -- was also really impressed... and we both started thinking that maybe we could surrender a few more shirts -- even the "precious" ones -- and make another, larger quilt one day. Best of all, however, is that Project Repat is here in the US, and provides fair-wage jobs to textile workers. They work with NuPath, Inc., which trains and employs people with disabilities. And as Project Repat has grown, they have brought in an additional production partner: 99 Degrees Custom, and are helping them get their business off the ground. 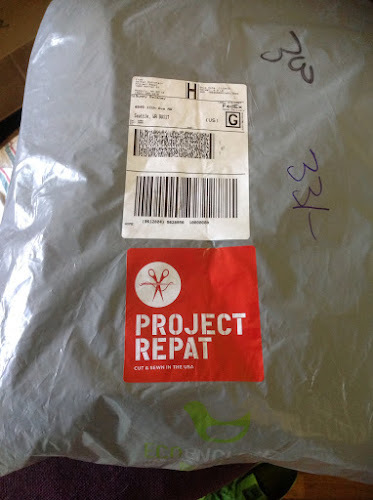 You can learn more about Project Repat -- or order your own t-shirt quilt -- at www.projectrepat.com. 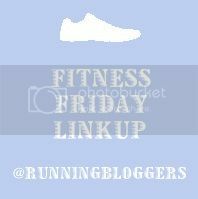 This post is my contribution to this week's Running Bloggers Fitness Friday Linkup -- because every runner has a box of race shirts in their basement!! LOVE this idea! I'll have to try it myself (once I've earned a few more shirts). Looks amazing! What a great idea! I want to do this with some of my school shirts. 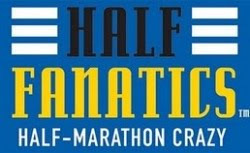 Once I get enough race shirts (I only have 2) I'm going to do this! I'm planning on making some blankets for my boys too with my favourite clothes they wore. I love it! Thanks everyone -- I can wholeheartedly recommend Project Repat -- the blanket is fantastic. And, yes, I'm saving up shirts for my next one! I too am crafty, and I have made a few quilts (each quilt is better than the last - self taught). I had planned on making a t-shirt quilt for my son's bed, but with his shirts being all different sizes, it was a pita. It's now in a 'i don't know what I'm going to do pile". I still love the idea, and I love your race t-shirt blanket, enjoy it, at least now you know those shirts will always keep you warm.